The Bearded Collie, or "Beardie" as he is known to his fanciers, is a medium-sized, agile, herding dog with a shaggy coat and an ever-wagging tail. 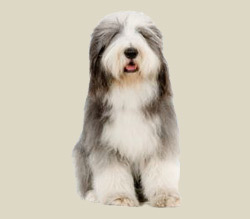 He is an ancestor of the Old English Sheepdog, and the family resemblance is obvious. The Beardie has a broad head, short muzzle and a shaggy coat all over his body, even under the chin hence the name "Beardie",. Beneath the dense, weatherproof outer coat lies a thick, soft undercoat. Its head and teeth are large. The eyes are wide set and harmonious in color with its coat, set high on its head and pendent. The ears lie close to the head and the tail is long and carried low unless the dog is excited. The Beardie is robust, hardy and active, but not massive. The color of the coat changes several times over the life of the dog. Puppies are generally born black, brown, fawn or blue. The puppy coat then fades to light gray or cream. As the dogs reach maturity, they darken again to their adult coat in any of the four colors, black, brown, blue, or fawn. The final coat color is somewhere between the puppy coat and the yearling coat. The boisterous beardie is lively and playful, full of enthusiasm and energy. It is smart and obedient, but it is an independent thinker with a clownish sense of humor. It likes children, but it may be too rambunctious for small children and may try to herd them when playing. This active dog needs either a good jog, a very long walk or a vigorous play session every day. It especially enjoys herding. The beardie can live outside in cool climates, but it is happier when allowed access to the house with its family. Its long coat needs brushing or combing every other day.